For many hikers, understanding the forest begins and ends with the location of trails and notable landmarks. Some of us like to delve a bit deeper, becoming familiar with local species of plants and animals. 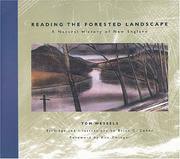 But Tom Wessels, author of Reading the Forested Landscape: A Natural History of New England, represents a rare breed of naturalist capable of using keen observation and logical deduction to paint a remarkably detailed portrait of the history of the forests and meadows of New England. As soon as I began delving into Reading the Forested Landscape, I found myself entirely fascinated with Wessels’ approach to decoding the past. Each chapter of the book opens with a single etching of a natural landscape; mostly forests, but also meadows and rivers. He asks the reader,” What can you deduce about this place based upon what you see here?” If you’re like me, you’ll stare blankly at these images wondering what you’re supposed to be seeing besides the obvious clusters of trees. But as each chapter unfolds, Wessels leads the reader through an enthralling, step-by-step analysis of the scene. Do many of the trees exhibit multiple, small trunks emanating from a single root system? If so, this could be evidence of past logging or fire damage. Are there dead snags (trees that died standing up)? Oftentimes, this is indicative of disease or pest infestation. Do many of the trees seem to be growing on raised mounds? If so, the forest you’re looking at now may have been entirely leveled by wind at one point in history. At the close of each section of the book, I returned to the original forest scene and marveled at the cues and indicators I could discern from what had originally seemed to be little more than “a bunch trees in the woods”. Reading the Forested Landscape: A Natural History of New England is simply a must-read if you’ve spent a good deal of your life enjoying the forests of New England. Wessels discusses the fascinating history of the region’s old-growth White Pines (which were entirely lost to logging in past centuries), explores the forest management techniques of pre-colonial Native Americans, and relates the drastic changes to tree distribution that have occurred as new diseases were introduced to North America. This book isn’t just a guide to decoding forest history… but an intimate portrait of New England’s past, recalling a bygone era that has been all but forgotten in this modern age. I walked away from Reading the Forested Landscape feeling almost as if I had been given access to secret information.. knowledge about the natural history of our home that somehow never makes its way into the conventional education of the ordinary New Englander. Wessels’ Reading the Forested Landscape: A Natural History of New England was truly a privilege to read and I can’t stress enough how eye-opening its pages will prove for those seeking to understand New England in a new and fascinating way. If you enjoy Reading the Forested Landscape: A Natural History of New England, be sure to check out Tom Wessels’ new book, Forest Forensics. I only recently discovered this new offering at the Connecticut DEP Bookstore and happily laid the money down for an opportunity to read another of Wessels works. Forest Forensics is something of a field guide version of Reading the Forested Landscape, offering full-color photography of cues and indicators that can be used to decipher the history of New England’s natural landscapes.